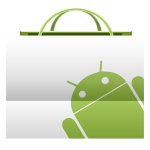 Do you want to stream all your Logitech Squeezebox content directly to your Android Device? 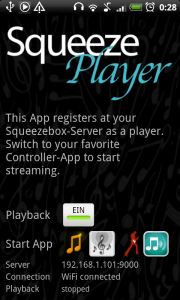 Then SqueezePlayer is your perfect match – it turns your Android phone or tablet into a SqueezeBox on its own! You won’t need a Squeezebox by the way – installing the (free) Squeezebox-Server makes you ready for music streaming. Make your music free! Now you can take all your music with you – car, school, work, garden, anywhere in your house. SqueezePlayer is able to stream your local music (see below for supported formats), internet radio stations or songs from Apps like Last.FM, Deezer or WiMP from your Squeezebox-Server directly to your mobile or tablet. (Rhapsody and Pandora NOT working right now, due to licensing issues, Spotify only works with the help of triodes plugin installed in a Squeezebox-Server, Napster only works with Windows-based server). For playback to be working via 3G you will need to open/forward port 9000 and 3483 on your router (as well as setting up a DynDNS service). A full tutorial about this topic you’ll find on my blog. 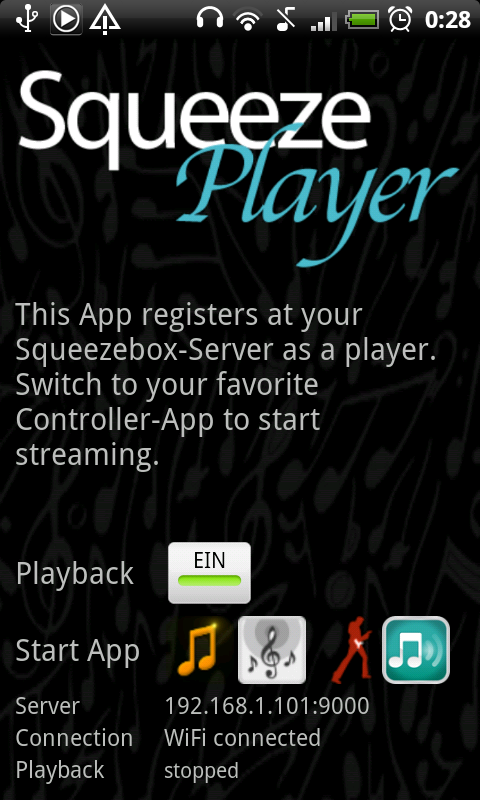 SqueezePlayer is a playback App – you won’t be able to control your Squeezebox (nor itself) with it. But there are enough Apps out there being a perfect fit: SqueezeCommander or OrangeSqueeze (both recommended) or free alternatives like the official Logitech App or SqueezeDroid. From the main screen of SqueezePlayer you can jump directly to any of these App, where you mobile will be among all other players as long as SqueezePlayer is activated. In OrangeSqueeze this also works the other way round: it will start SqueezePlayer automatically from the players list or upon start, so here it is highly integrated. For SqueezePlayer to work you need to set up the Logitech Squeezebox Server (recently renamed to “Logitech Media Server”). I test against version 7.5 – 7.7 of the server.